Champagne is a stunning new variety in the netherland dwarf breed. Champagne D' Argent are currently the only breed that the color is accepted. Champagne is an accepted color in the dwarfs already in Europe. Babies are born solid black, although often have a telling sign of a pink nose, and make a metamorphosis into the beautiful old silver color on top, with a black base. I hold the current COD (certificate of development). My application was accepted on November 1, 2013. The next step for the variety will be this spring when the ANDRC will send out ballets for the members to vote whether they would like the breed color to be accepted. As long as the members vote yes, my first presentation will be in 2016. I am planning on attending the ARBA conventions leading to my first presentation, so please come admire them in the exhibition section! This color is for a Black Self with the Champagne silvering gene. Other colors can be ‘silvered/champagned’ but their color expression [phenotype] will not be the same as it is on a Black Self. The body color is to be a bluish white. The whole body is to be moderately and evenly interspersed with longer jet black hairs, giving an old silver effect when viewing from a distance. The fur is to have a rich gloss. The nose and muzzle are to be slightly darker than the body color to form the butterfly. Head and ears are to match body color as closely as possible. Undercolor is to be dark slate blue, carried as deep down the shaft as possible, with the allowance for fading in seniors showing age. Eyes – Brown. Lack of jet black hairs; brassiness; faded undercolor; butterfly too dark; too dark or light in body color; head and ears dark in color; but allowing for slightly heavier pigmentation when combined with a good dark under color. 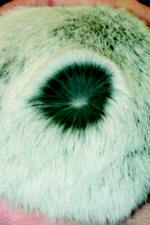 White patch or spot(s) (not molt spots); cream color or yellow cast; less than 50% [Champagne] color showing on the head and body. Champagne's are essentially a black rabbit with 2 sets of silvering genes (si). A solid black rabbit would be SiSi, while a chapagned rabbit will be sisi. A rabbit showing one silvering gene (black rabbit to champagne) will carry one non silver gene and one silver gene (Sisi), we are calling these rabbits mid chamapagne. You can determine what you geneticly should get out of a pairing using a punetts square. Theoritically you would get 1/2 champagne colored rabbits(sisi) and 1/2 Mid Champagne (Sisi). mid(Sisi) X mid(Sisi) = 25% champagne(sisi), 50% mid(Sisi), 25% black(SiSi) this is not a recomended pairing as it could be hard to tell rabbits that carry the gene from rabbits that do not.